Although there will be a brief review of anatomy and physiology this Course is of a highly practical nature the majority of the day will be spent on identifying reflexes and looking at a variety of techniques for effectively locating and working reflexes of the nervous system (particularly the location of the spinal column and spinal nerves) and all the endocrine glands. Deeper working techniques will be explored in addition to more gentle, balancing ones providing the practitioner with effective treatment tools that can be applied to a variety of different clients. Upon completion of this Course I will be able to ? 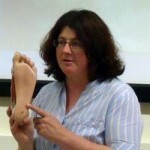 You must be a qualified Reflexologist (Level 3) to attend this Course.